For those of you who missed the Market Basket debacle this summer, here’s a recap. Market Basket, a chain of 71 supermarkets in New England, has over the past few decades, successfully sliced out a niche in the lower-priced segment of the market, appealing to both customers and workers through tremendous prices and employee benefits. Born and raised in Boston myself, I have spent many Sundays perusing the aisles of Market Basket, as the supermarket is my number one choice for groceries. But unknown to most (until this summer), is that Market Basket has been riddled with family feud for nearly a century. The feud dates back to 1916, when Athanasios “Arthur” Demoulas, established a store in Lowell, Massachusetts, specializing in fresh lamb. In 1954, Athanasios bestowed the business to Mike and George Demoulas, who jointly built the chain known today as Market Basket. In 1971, George Demoulas passed away suddenly – an event that ultimately instigated one of the lengthiest and most expensive series of lawsuits in Massachusetts history. Pay attention – the family web gets complex. George Demoulas (the one who passed away in 1971) had a son, Arthur S. Mike Demoulas had a son, Arthur T. In 1994, Mike Demoulas was found guilty of essentially stealing $800 million from his brother’s widow – by transferring 92% of the stock belonging to the other side of the family to entities that he controlled. The following year, a judge requisitioned Mike to return 43% of the company to his brother’s family. The court case dominated the headlines in the 90’s because of the actual fist-fights that broke out between the Arthurs in the courtroom. The ultimate result: a 50.5 / 49.5 percent split between cousins Arthur S. and Arthur T, and the establishment of a seven-member board of directors. Although Arthur S. owned 50.5%, the company remained in control of Arthur T’s side of the family as a result of a “voting alliance” with Rafaele Demoulas Evans (sister-in-law of Arthur S). And thus, Arthur T reigned Market Basket (quite successfully) for decades. Essential to this story is an understanding of the personality differences between Arthur S. and Arthur T. Arthur T. is beloved among customers and employees alike for keeping prices low, treating employees kindly, and driving Market Basket’s success. Employees report that Arthur S is more interested in profits and pay-outs to shareholders, both of which they view as threats to their compensation as well as to Market Basket’s culture. In 2013, Rafaele Evans shifted allegiances from one side of the family to the other. And it was this one single action that allowed Arthur S’s side of the family to gain control of the board of directors. The following year, on June 23, 2014, the board of directors fired Arthur T. as CEO of Market Basket. That day, seven senior corporate employees resigned in protest – inclusive of the CFO, VP, Treasurer, Executive VP, Director of Deli, & the Director of Advertising. 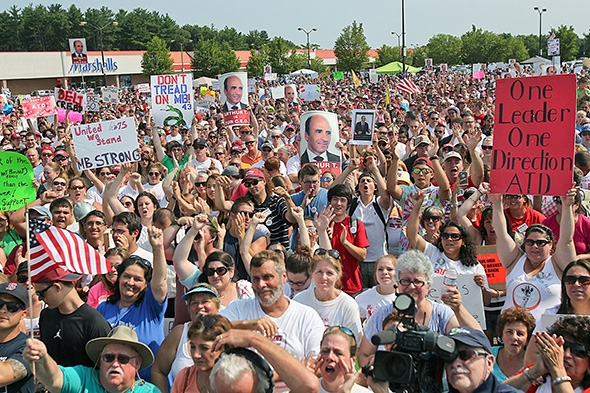 On July 18th, over two thousand employees rallied outside the corporate headquarters in Tewskbury, MA (despite warnings from chief executives that they would be fired if they missed work to attend the rally). And low and behold, two days later, eight employees identified as protest leaders were fired (several of whom had worked at Market Basket for over 40 years!). July 21st marked the second rally at Tewskbury headquarters, with a crowd of over five thousand people. The protests infiltrated into the stores, and aisles were stripped bare, replaced with pictures of the beloved Arthur T.
Pictured below: ESG Vigilantes, if you will, thousands of customers and employees demanding change through social movement. Unified through a common goal: reinstatement of their beloved leader. 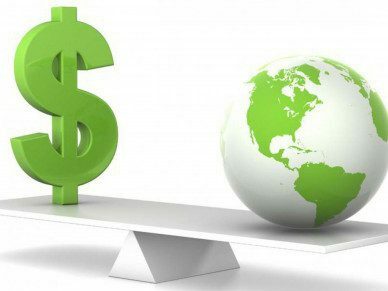 On July 23, Arthur T offered to buy the 50.5% of the company that was controlled by Arthur S. Outside analysts estimate total company value to be about $3.5 – $4 billion. On July 25th, thousands of protesters join once again outside Tewksbury headquarters. A small ensemble emerges outside the BOD meeting and present the directors with 100,000 signatures, petitioning for Arthur T’s return. Employees continue to reject demands to return to work. Shelves are empty. The company is having trouble paying its vendors and supply ceases to exist. Senior employees declare their intent to sue on grounds of wrongful dismissal. A charge is filed with the National Labor Relations Board, accusing Market Basket of violating employees’ workplace rights. Governors Deval Patrick and Maggie Hassan are working tirelessly (to no avail) to help shareholders come to an agreement. The month of August begins to look like a tipping point for Market Basket, now in serious danger of suffering severe hardship and being forced to close stores. And then, to the relief of thousands, on August 27th, around 11:30 PM, a deal for $1.5 billion is finally inked. “Effective immediately, Arthur T. Demoulas is returning to Market Basket with day-to-day operational authority of the company. All associates are welcome back to work with the former management team to restore the company back to normal operations”. According to my Massachusetts friends, the following day at Market Basket was quite the spectacle. Cheers and hollers were deafening. Tears of joy were shed by numerous customers and employees. Posters and banners were a vision, welcoming back Arthur T. Customers were hugging meat managers and cashiers were hugging customers. In fact, it seemed like everyone was hugging. “Wow. I feel like I won the lottery. What a huge relief” – Buddy Wemmers, a Market Basket truck driver. It is rare to have an internal uprising of such magnitude without a union. It is rare for a CEO to have such an effect on so many people. In fact, CEOs are fired every day – and more often than not, business just continues as usual. Yet, in New England, thousands of employees put their own jobs at risk, for Arthur T.
Market Basket, though a mere blip on a global radar, is exemplary of the potential power social movement can have. Market Basket is exemplary of America’s hunger for business that is not mutually exclusive – a desire for business to be run in such a manner that customers, employees, and management can all emerge as winners. Great story–and a hopeful one for employees and customers who want well-run companies to stay that way. Great review of this remarkable story. It was quite exciting seeing employees and consumers battle for their beloved CEO.